Ma Nish Tana Ha Leilah Hazeh—Why is this night different from all other nights? As we sit at the table and sing the Four Questions, we highlight the ways that difference is at the heart of the Passover Seder. We intentionally change the foods that we eat, the way we eat them and how we sit at the table. For children with autism, cognitive disabilities and/or sensory sensitivities, doing things in a different way–change from routine—can be especially challenging. Routine and predictability provide structure and reduce anxiety for many people with social and communication challenges. To help all of our kids get ready for a night of different foods, music, setting and people, we can take steps to prepare them in advance of the seder to help reduce anxiety and also build excitement for a new experience. As a mom of a teenage son with an intellectual disability and autism and as an educator who has worked with many families with kids of all abilities, I’m sharing some tips that I hope will be helpful for your family. Please be sure to what’s worked well at your seder in the comments below! 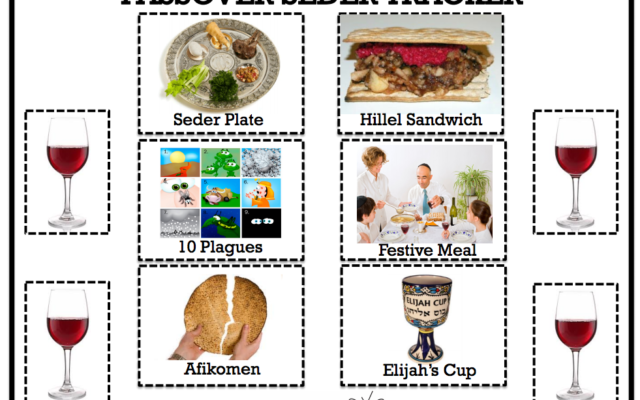 Get familiar with the Passover story and songs before the Seder: There are so many wonderful, multi-sensory ways to teach your child about Passover. One way to begin is by watching Passover-related videos—I especially like those from Shalom Sesame and bimbam. Start playing Passover music that you can listen to and sing together…jkidphilly has a great Spotify list that you can play in the car or just have on at home. There are also lots of apps to download if your child uses an ipad or other tablet. Plus, the amazing staff at Gateways has created social stories, games and visual blessings that are free to download and print! 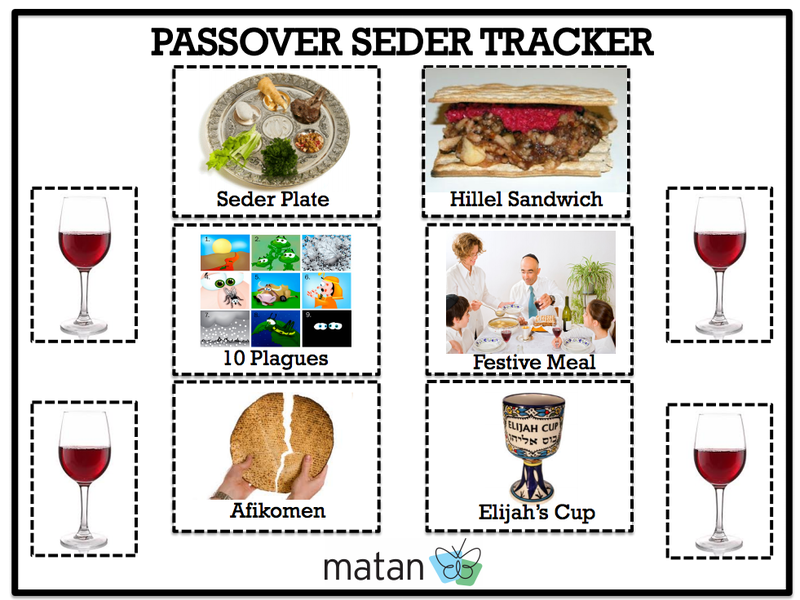 I also love the visual seder tracker created by Matan. Consider the sensory environment of your seder: If you’re attending a seder at the home of a family member or friend, you can ask ahead of time if there’s a room where your child can go take a break if he/she is feeling overwhelmed or restless. Depending on how long your child is able to sit for the seder, you may want to consider bringing a babysitter or aide so that you can stay and participate in the seder if your child needs a break. If you’re having a small family seder or hosting the seder in your home, you may still want to have another adult who can hang out with your child as needed. Make tactile things available for everyone: There are so many fun hands-on objects that your child—and everyone at your seder table can enjoy during the seder—wooden Passover puzzles, Model Magic that can be used to sculpt scenes from the Exodus story, crayons, markers and dot paints to color your own Haggadah. What fidgets does your child like that are quiet? Bring them along to have by his/her side. Plan for what food your child will eat: Children who have sensory-based feeding issues may only eat a limited number of foods and trying all of the different foods at a typical Passover seder—from maror and charoset to gefilte fish and matzah ball soup—may not be possible. I can remember many years when my son ate matzah, fruit and some carrot sticks; the seder wasn’t a time to struggle about food. You can ask your host in advance if you can bring some of your child’s favorite foods. Have a nice big snack before the seder—it helps everyone! You can also introduce your child to the smells that may be overwhelming—open a bottle of horseradish, for example, and let your child take a little whiff. This exposure can help your child get used to the array of smells that are part of the seder meal. Make memories to draw from next year: Take photos of your child helping you get ready for Passover—cleaning, going shopping for special Passover food, making a Passover craft together. Snap a photo or video of the seder table or of your child singing a Passover song with you. Place these special memories in a folder or album that you can access next spring at this time when you prepare for Passover again. Making a different night more familiar year by year may make it easier for your child to enjoy Passover more each year!